Tonight is a new epidsode of Pushing Daisies and I hope lots of people watch it. There have been rumors that it might be canceled and I can't bear the thought. 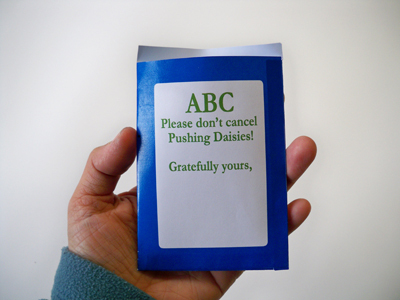 "Save Pushing Daisies" fans encourage mailing ABC packets of daisy seeds. It's kind of challenging to find flower seeds at the store in the middle of November so I made my own. 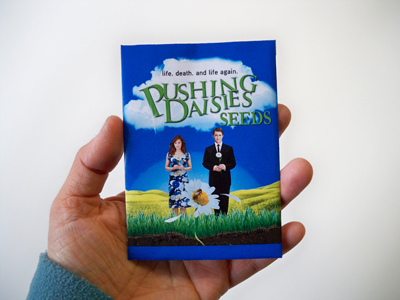 I used the seed packet favor template I designed awhile ago, so it wasn't very hard. I made extras for my friends to sign and mail in too. 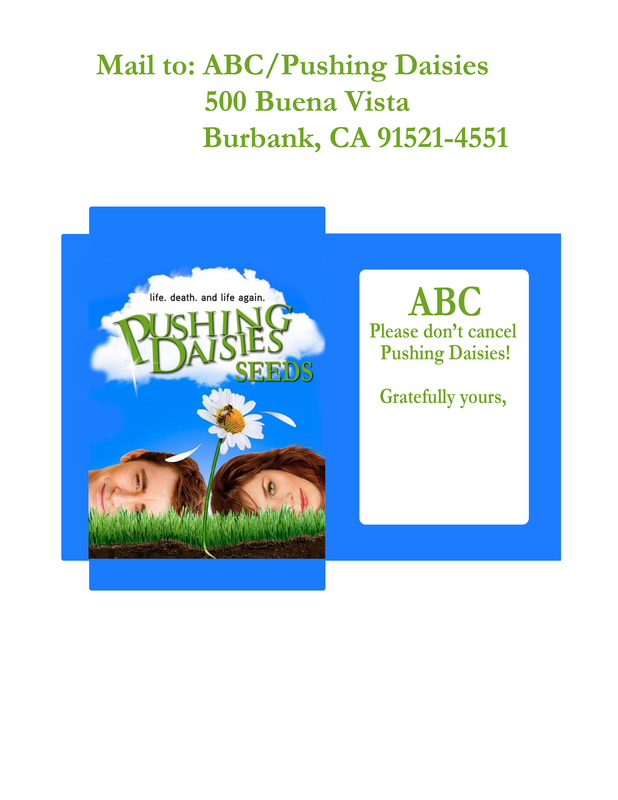 If you love Pushing Daisies and want to let ABC know you can download version 1 or version 2 of these Save Pushing Daisies seed packets to mail to ABC. I just saw this on ABC.com communities and thought of you first. I love this show and don't want to see it go away. I signed it and will also be sending a seed packet to ABC. I read this morning that it was canceled. I'm so sad! ABC really messed up this time. I'm considering a boycott. heh. "The network has not actually used the word "cancelled," but it is not picking up the shows for the second halves of their seasons." "The network informed producers of "Daisies," "Money" and "Stone" that no additional hours will be ordered at this time. The network left the door open for ordering episodes in the future, though that is considered unlikely." I am hanging on to any thread of hope I can. Perhaps it will be picked up again next fall or by another network. I never did watch this show, because I watch just WAY too many, but I am sort of bummed, as I like Kristen C. I do however LOVE Eli Stone and have been a faithful watcher, so this is just a bummer of a report! I love your packet ideas though... so cute!